When I look into my archives every once in a while,I know one area which lacks posts is in the bread section.I've baked very little breads and I really don't know why I am apprehensive when it comes to baking it.I've got good quality yeast with me and foolproof recipes too,but something is lacking somewhere.So when I asked Suma of Cakes and More for a guest post,I was kinda hoping that she'd bake bread and Voila,she did! Suma,a fellow blogger,a keen baker and a good friend,agreed instantly when I asked her to do a post for Easycooking readers,though it was at a very short notice.Check out her recipe for a simple no knead bread.Over to Suma. I am extremely happy and honored to be guest-posting for Divya, one of my favorite bloggers and friends. I am also very excited as this this my first ever guest post! Thanks so much Divya, for giving me this opportunity to share a recipe, connect with the readers of Easycooking. Oh! I think I forgot to introduce myself first - This is Suma, I blog at Cakes And More,a blog which is basically about baking, some desserts and a bit of traditional cooking thrown in as well. Like most of us, I am obsessed with food, baking particularly. I started writing my blog when I was making all of 2 desserts and baking 4 3 2 cakes which summed up my baking world, hence had given my blog the name. Now after 2 years, along with a couple of other new things, yeast is my new, big time, growing obsession. I am discovering how magical, rewarding and satisfying, not to mention delicious, baking bread at home can be. But then, I can be really lazy at times. But again, good food, and good food in a hurry, is a bare necessity of life! No knead breads come as a savior as they can be put together with minimum fuss and effort. And your home will be smelling of freshly baked bread in no time at all. Its even more fun as you could play around with the recipe and create breads with different flavors. 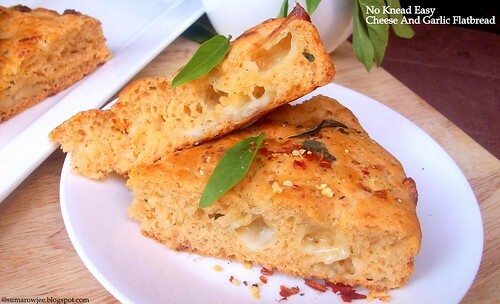 Here is another variation with roasted garlic and cheese, Cheese and Garlic focaccia from the King Arthur Flour site, a site I love for all their fabulous recipes, reviews and very useful tips. 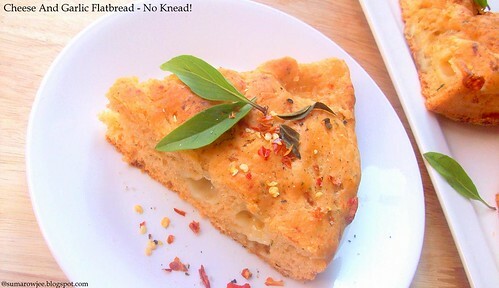 This is a variation of the No fuss Focaccia .The idea is a mildly garlicky, soft, slightly chewy, herbed flat bread with bits of cheese in between bites. I have added a bit of pizza sauce to the batter to give it a hint of tomato and pizza flavor of course (doesn't taste the same as pizza though). You could omit the sauce and use the rest of the ingredients if you wish it to be tasting only of herbs, cheese and garlic. This is half the original recipe, which I have baked in a 9'' round tin. 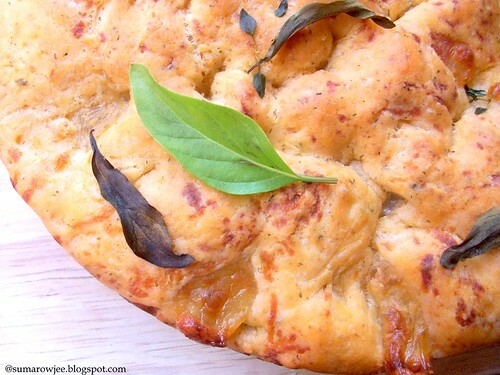 You normally do not need to line the tin to bake a focaccia as you want the bottom crust to be crispy. After reading the reviews about the melting cheese making someone's bread stick to the pan, I thought its better to line the tin and sacrifice the crispy crust ...for the joy of getting the bread out of the tin in its whole..sorry, full glory! Procedure: Grease and line the bottom and sides of a 9'' round tin. Grease again. Sift the flour, salt, chilli flakes and dried thyme to mix well. Keep aside. In a large bowl, take the sugar and the yeast. Add the warm water ( If using active dried yeast, you would need to proof it first using the warm water, yeast and sugar, let it stand for about 5-10 minutes till frothy and then proceed with the next step). Add the sauce mixed with water and the oil. Mix. Tip in the flour mixture . Stir with a wooden spoon till all the flour is incorporated. Then beat 20 times with the spoon. The batter will be sticky. Mix in the chopped garlic and the cheese cubes. Transfer the batter to the greased tin. Push gently with greased hands to cover the entire pan. Spread some oil lightly over the surface. Dimple the dough with your fingers. Cover with a greased aluminum foil and let rise in a warm place for an hour. The dough will be puffy (not necessarily double the volume) at the end of one hour. Towards the end of the rise period, pre-heat oven to 190 degrees C / 375 degrees F. Drizzle oil on top. Remove the foil, sprinkle the herbs and the basil leaves. I do not think it would be a good idea to top with cheese as it will get almost burnt by the time it bakes. Bake for 35 -40 minutes or till light golden brown on top. The bread will not brown a lot as there is very little sugar in the batter. The bottom should sound hollow when tapped. It should read between 200-210F on an instant read thermometer. Cool on the wire rack in the pan for 10 minutes, then remove from the pan, place on the rack and cool further. Slice when it is still a bit warm (not when hot). You do want to eat the bread when the cheese is still a bit gooey right? It doesn't taste all that bad either when its completely cool too. Ever heard of cheese tasting terrible at room temperature? But melting cheese is something I have no complaints eating whatsoever. How about you? Please note: If you not wish to use the sauce, omit it and use water instead. You will be using a total of 3/4 cup of water for the entire recipe. Do not add more sauce unless you want the bread very tangy. Use good quality dried herbs for maximum flavor. Ooops! when I introduced myself, I forgot to mention, I do tend to go a bit overboard when I talk! Thank you for reading my post, hope to see you again! Thanks again Divya, it was fun doing this post for you! at 8:00 AM Labels: Baking , Bread , Cheese , Eggless Bakes , Guest Post. Wat an incredible flatbread, cant wait to try them..Kudos to both of you..
wow v nicely done flatbread...perfect plating! Very Nice Post! Perfect with Soups! Interesting recipe, book marked :) thanks for sharing! can i use wheat flour instead of plain flour? None of my yeast worked..tell me if i buy a bulk pack of 500gms...of gloripan will it stay good in freezer..?? or will it be waste of money to buy a bulk pack..